These original My Little Pony toys from my childhood are about thirty years old now. My heart is always swept with sweet nostalgia whenever I look at them. The pegasus pony on the right is Surprise. Thanks to the My Little Wiki, I learned that she is actually the So Soft Surprise version standing in the surprise pose. The pony on the left is Scoops. She came as part of the Satin Slipper Sweet Shoppe playset (which I loved and which is long gone) and is standing in the sugarberry pose. The baby unicorn pony the right is Baby Sparkle Gusty. 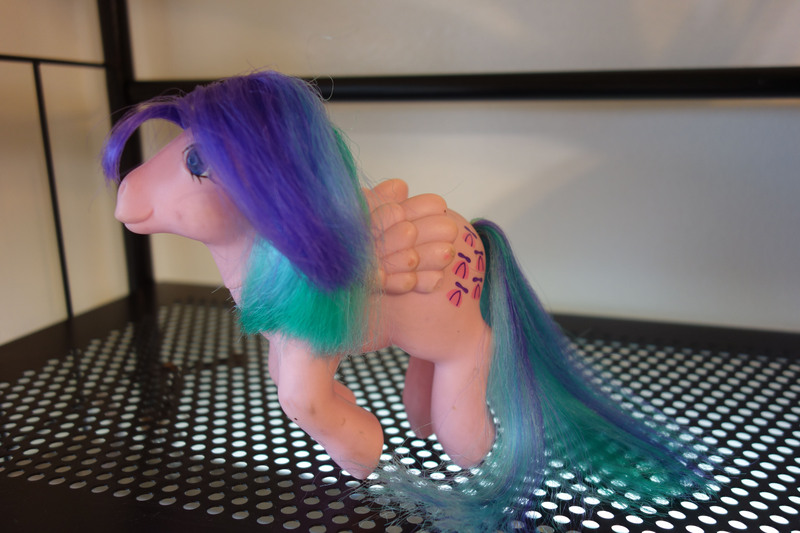 This pony is translucent and she is standing in the baby glory pose. The baby pegasus pony on the left is Baby Sparkle Firefly. 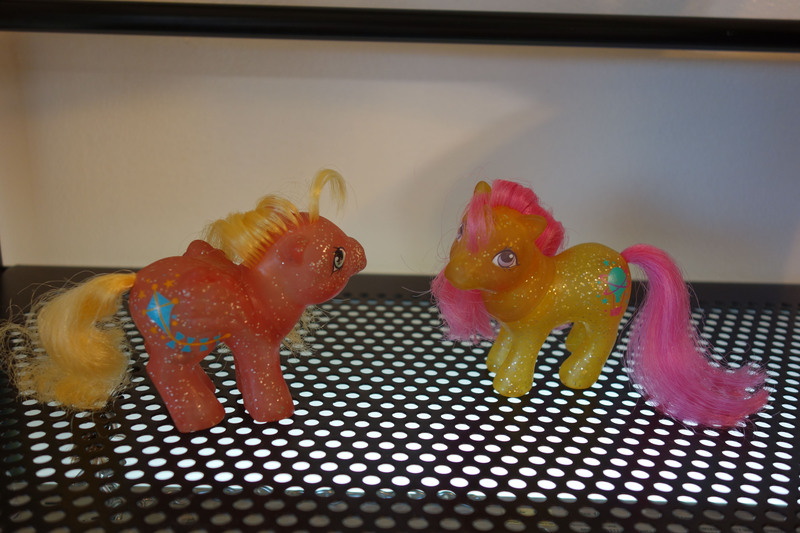 This pony is also translucent and she is standing in the baby surprise pose. This pegasus pony is Whizzer. She is a twinkle-eyed pony standing in the whizzer pose. This up-on-her-toes pose makes her prone to tipping over! 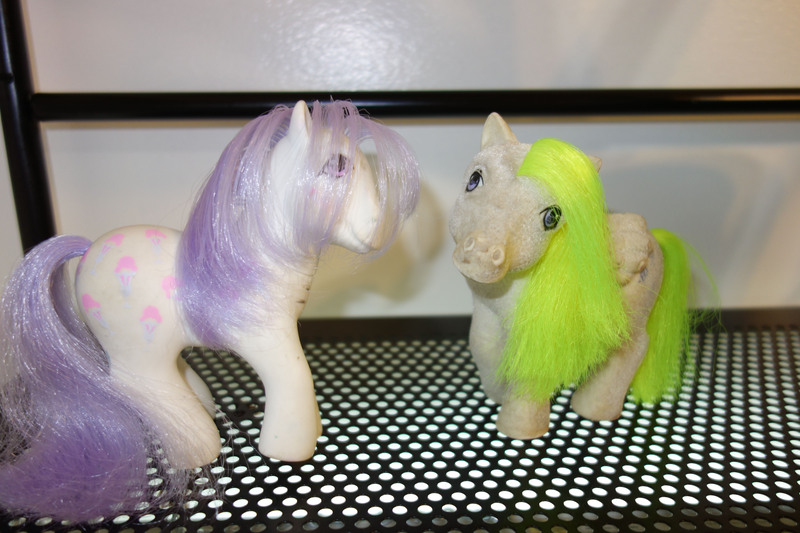 These ponies—created for kids from Generation Millennial—still get played with occasionally by kids from Generation Z, so I recently spruced up their manes and tails using this helpful Restoring a Modern Barbie Doll with Matted Hair tutorial. This entry was posted in Life! and tagged My Little Pony, My Little Pony toys, nostalgia by tarvasalutes. Bookmark the permalink.